The moon rolled across the sky. It was our night light as it shone through the smoke hole. The 27 feet diameter earth lodge we sat in was to be my home for the week. I was in the hills of Nebraska, near Stockville. The sun set that evening. We were finishing up some braintan skins and pumping out fires with hand spindles and bow drills. It was the Autumn equinox. Les had built this lodge and two others like it with the help of his wife, Jan and their friends. We waked to the top of a nearby hill and we could see the horizon for 360 degrees. I could also see many basketball sized rocks. They were laid out in a circle about 70 feet in diameter. 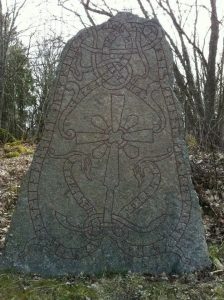 Many lines of stones radiated from the center in various directions. This was an eye opener for me. 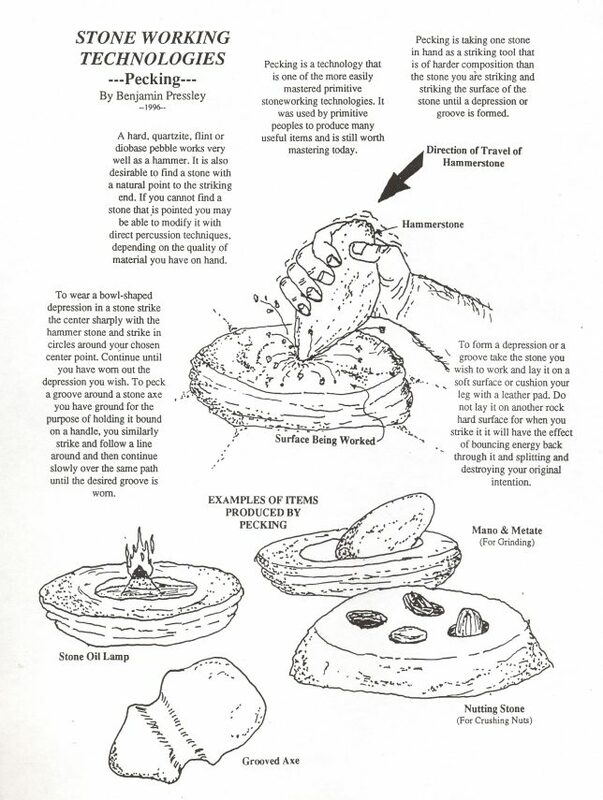 The medicine wheels I’d heard of previous to this were weekend gatherings where someone told you or showed you your problems and signs and then ‘wheeled’ you for $400 or so! With all due respect to the ‘wheelers’, I think Les’ approach better meets my bank account! 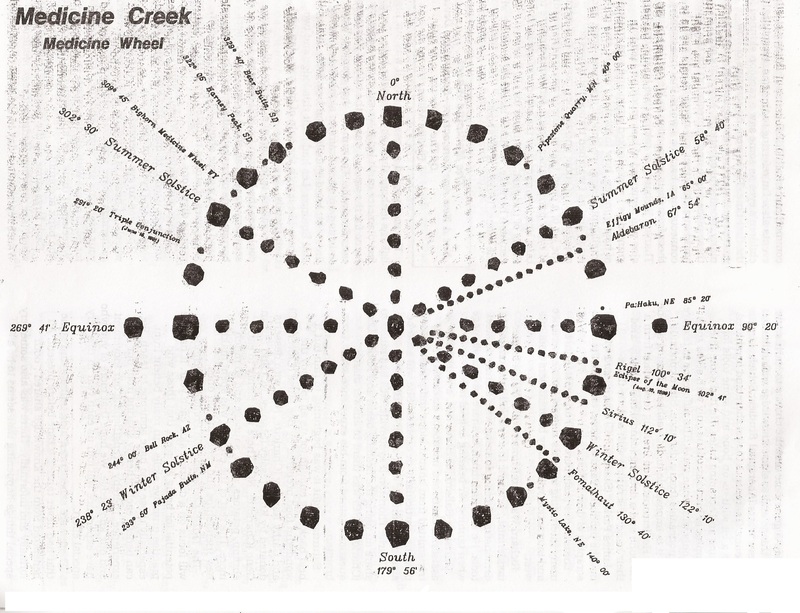 Each large stone on the perimeter of the circle or wheel (See drawing: Medicine Creek Medicine Wheel) represents a day in the cycle of the moon. 28 days (stones) represent the cycle from New or no moon and back to the New moon again. A small stone sits on the large stone that represents the place in the current cycle. A line of stones run the inside diameter of the circle from north to south and east to west. Other spokes of the wheel radiate from the center marking the location in the heavens of particular stars. 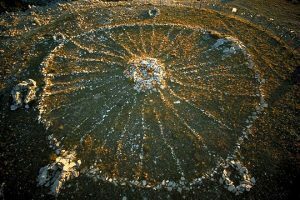 On the circumference of the wheel small stones between ‘moon cycle’ stones mark the direction of special places on Earth. On the eve of the equinox we gathered on the medicine wheel’s East stone and watched the sun slowly walk down the sky and set behind the West stone. We sang and played our drums and celebrated Les and Jan’s anniversary. It was a special time at a special place. I was invited to teach again next year…I am going to go back. It was great to realize the medicine wheel isn’t just another over-spiritualized New Age concoction. Helping to tie the heavens to the Earth it has much to share. 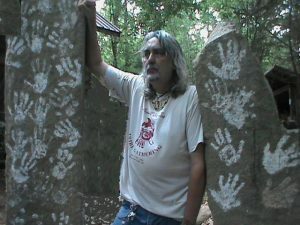 Petroglyph: Signs etched into stone. Pictograph: Signs painted on stone. 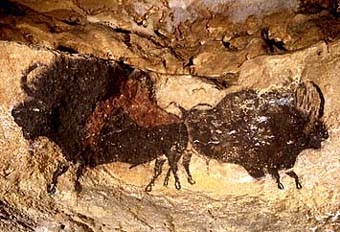 Lascaux is famous for its Palaeolithic cave paintings, found in a complex of caves in the Dordogne region of southwestern France, because of their exceptional quality, size, sophistication and antiquity. 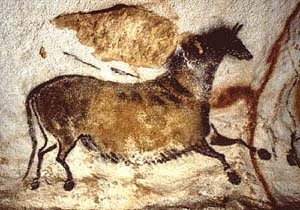 Estimated to be up to 20,000 years old, the paintings consist primarily of large animals, once native to the region. 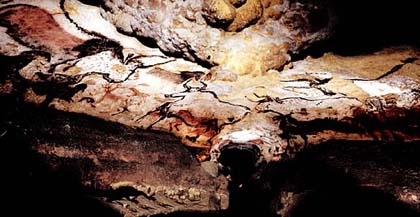 Lascaux is located in the Vézère Valley where many other decorated caves have been found since the beginning of the 20th century (for example Les Combarelles and Font-de-Gaume in 1901, Bernifal in 1902). 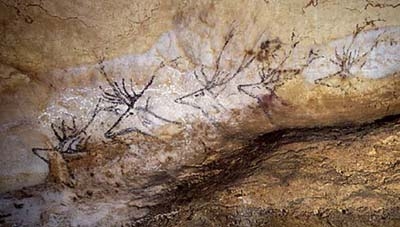 Lascaux is a complex cave with several areas (Hall of the Bulls, Passage gallery) It was discovered on 12 September 1940 and given statutory historic monument protection in December of the same year. 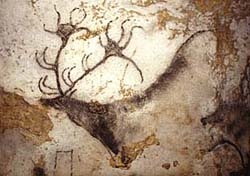 In 1979, several decorated caves of the Vézère Valley – including the Lascaux cave – were added to the UNESCO World Heritage Sites list. I am glad you asked! 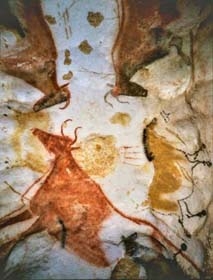 Cave art fascinates me on so many levels. 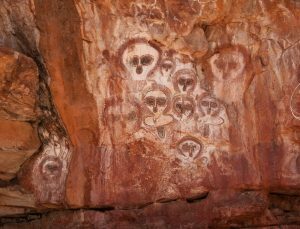 As an artist I am amazed at the beautiful artwork miles back in a cave where no one can see it. I wonder why they didn’t put it on the outside of the cave and sign their name to it, right? Well in some cases it is on the outside on rock faces and such. I also am amazed about how they lit their way to do this amazing work, I mean, they certainly had no flashlight! 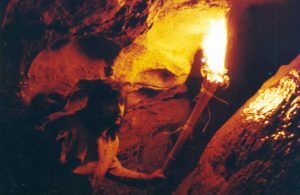 I know from my research that torches and stone oil lamps were used and even went into some caves for myself to test out some primitive torches and oil lamps. For an entire account of this adventure as well as my research just click here. 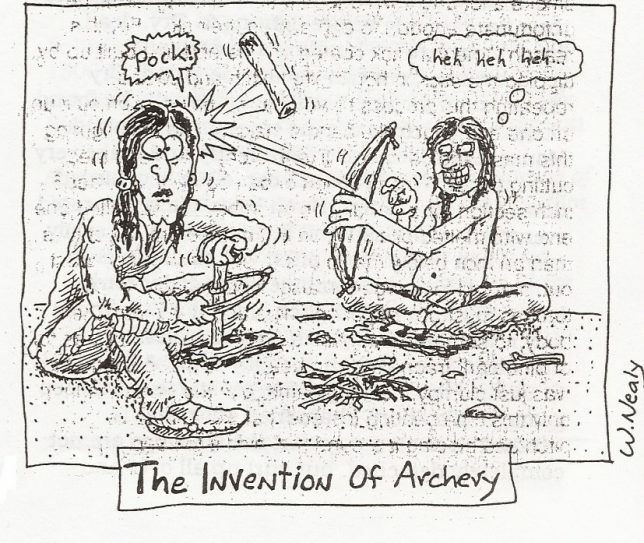 This research involved several primitive/survival skills. It involved pecking and shaping one stone with another to make stone oil lamps. It also involved a project with one of Steve Watts’ workshops where we moved a huge megalith stone by primitive means like pulling it across logs and then standing it up with an A-frame. We theorized these were the same methods used to stand those huge stones up at Stonehenge. It also taught me how to light a trail or cave if I were in a survival situation. I experimented with pine pitch and oil as fuels, cattail fluff for wicks, dry cane bundles for torches. I experimented with different ochres and pigments mixing them with hide glue for adhesive and water. I tested glues that could made in the wild like pine pitch glue and hide glue. 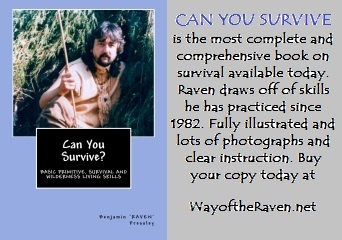 Hey did you know Raven’s comprehensive survival book CAN YOU SURVIVE? is now available as a full color e-book? It’s true! And it’s only $10! To order just click on the picture below.